An exhibition entitled ‘Don Van Vliet Works On Paper‘ runs 27 October 2007 – 1 December 2007 at David Kordansky Gallery in Los Angeles. The exhibition is organized in collaboration with Michael Werner Gallery and includes Van Vliet works from the mid-1980s to the early 90s. The opening reception will be held on Saturday, October 27th from 6 to 9 pm. 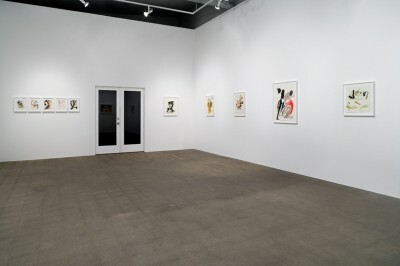 Further information can be found at David Kordansky Gallery’s website. Here’s a bit more information about the exhibition. There are 18 works on show, all untitled and dated between 1985 and 1992. Most are 20 inches by 14 inches (51 x 36cm) although a couple are bigger. There is a set of five which are only 10 x 7 inches. It looks to be an interesting collection, although probably not as visually exciting as the larger oil canvases. However, there are familiar themes, shapes and colours … all done mainly in ink but many with pencil, gouache, crayon or metallic pigment additions. Definitely worth a viewing if you can make it.